From useful marijuana apps to help you identify what you just bought, to maps for finding a great dispensary, there is nothing a cannabis app developer can’t come up with. They have even found a way to turn your phone into a scale! And the developer Chris Kirchnavy has really made a great marijuana related app that will be of huge help to cannabis users. 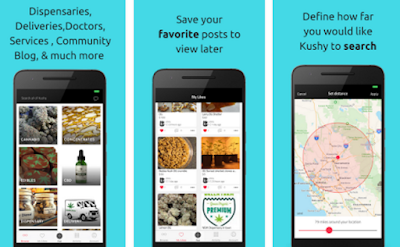 Listed under the name Kushy on both App Store and Google Play, the app is one of the most comprehensive and helpful apps that helps users find anything cannabis related. The app includes info about: local dispensaries, deliveries, doctors, member to member ads, and even services, and community blog where different topics are discussed frequently. Simply, great amount of useful info is put in one place. What makes Kushy really useful and helpful is its search feature. You can search by category or user names; filter the search results by distance, price, category and see the most recent and most liked. In that way you may always be sure that you will make a relelvant and right choice. The app is neatly and smartly organized. It requires easy sign up and after that you can use all capabilities, including following and contacting other users. Kushy is free and available for free on the App Store and Google Play for any cannabis lover! Get it for free and find out more about it on the official website.